The data retention policy that you set on the Your Account page will only delete the booking information from YouCanBook.me. It will not delete the information from your linked calendar. If you set the data retention policy on the Your Account page to, say 12 months, all bookings from more than 1 year ago will be deleted from YouCanBook.me. How can I obtain the data processed by Youcanbook.me? The data we have for your end-users is available to you through the bookings dashboard. You may also find information on your connected calendar account, and correspondence through email. What if my booker requests that I delete their data? 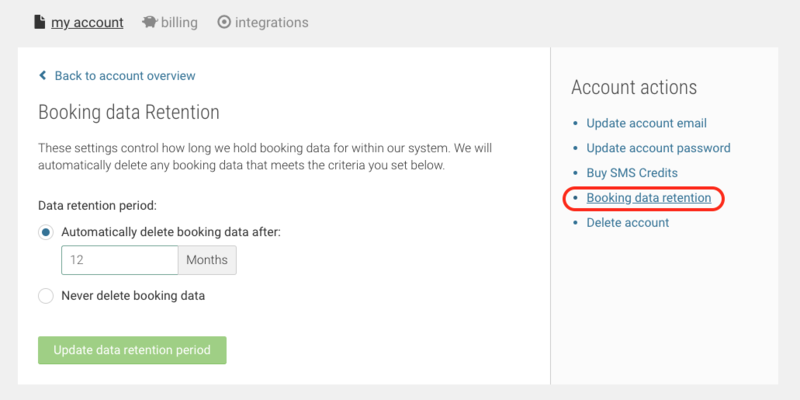 The best way to delete the data is to delete the bookings from within the bookings dashboard. You can search for the user's email address. You also can do the same on the connected calendar and the email account that is receiving notifications about the booking. Setting data retention limits can also help you clean up end-user booking data. If you have specific questions about end-user data deletion, please get in touch with us.